To meet specific needs and foster a close relationship with each customer, the Tokyo Gas Group set up the Tokyo Gas LIFEVAL network as a one-stop shop for products and services that improve the quality of life. As of April 1, 2018, the network consisted of 32 corporations in 62 regional blocks. Tokyo Gas LIFEVAL performs a number of tasks, such as periodic safety inspections of gas equipment, meter readings, opening and closing of gas valves, the sale, repair, and installation of gas appliances, and processing of applications for gas and electricity services. In addition, they provide information related to energy and daily life, such as plumbing renovations, energy conservation and power generation, to help local residents enjoy safe, environmentally friendly, comfortable lives. We also actively hold fun, experience-oriented events such as cooking classes featuring up-to-date kitchen equipment that participants can enjoy seeing, touching and using. We provide a variety of training for LIVEVAL personnel in accordance with their objectives and occupational positions to improve their technical and customer service skills. In addition to supporting human resource development, we strive to offer better services and proposals through a system for collecting and sharing customer feedback on LIVEVAL. The Tokyo Gas Group operates the Enesta and Enefit service outlets, in addition to LIVEVAL, to provide various services for supporting comfortable lives. What we call “Always Reliable Services” are intended to give customers peace of mind in using gas appliances while addressing a range of daily needs. In our efforts to provide customers with a sense of security, we broadened the lineup of Emergency Home Assist, Gas Fixture Troubleshooting Support and Residential Monitoring with the addition of Electricity Troubleshooting Support and Gas Fixture Special Support in April 2018. *1 Customers must satisfy certain conditions to receive Gas Fixture Troubleshooting Support. Please visit the Tokyo Gas website for details. Some models are not covered by this service. *2 Those in the service areas of TOSAI GAS, Inc. and Higashinihon Gas Corporation and in the Moka district served by NIPPON GAS CO., LTD. are not eligible for this service. *3 Customers bear travel-related holiday and overtime wages as well as repair fees (technical fees and parts costs) and other expenses (diagnostic fees, parking charges, etc.). We respond around the clock to problems with plumbing, house door locks and windows. Customers who receive Tokyo Gas gas and electricity package discounts are exempted from the monthly fees*5 for this service. Users have expressed their gratitude for the quick response to plumbing problems and free-of-charge service. *4 Customers must satisfy certain conditions to receive Emergency Home Assist Services. Please visit the Tokyo Gas website for details. *5 Although travel expenses and labor fees up to 30 minutes by one worker are not charged for the initial response, there may be extra charges such as for parts and special work fees. Customers fully bear second response fees such as equipment replacement. 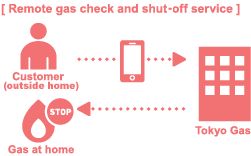 Tokyo Gas remotely shuts off gas supply on behalf of a customer in response to a personal call or website request from outside the home about a failure or possible failure to turn off gas equipment. We also call customers if we notice unusual gas usage such as an extended period of non-use. 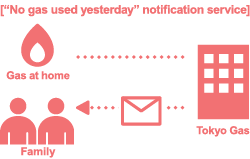 Moreover, if no gas is used by a customer between 0:00 and 24:00, we email family members registered in advance. This is helpful for in terms of caring for family members who live far away. In October 2017, this service added an optional contract for emergency support through a business cooperation agreement with security service company SECOM CO., LTD .
*6 We may not be able to provide this service, depending on specific circumstances. For information, please visit the Tokyo Gas website or call 0120-117744 between 9 a.m. and 5 p.m., except on Sundays and holidays. We respond to problems associated with electric equipment or power distribution failure without charging fees for up to 60 minutes of labor needed to investigate the cause and perform temporary repair as well as worker travel expenses*8. 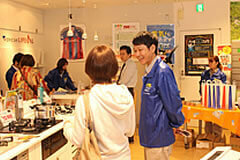 The service is available for customers of the Tokyo Gas electricity service. *7 Electricity Troubleshooting Support is available under certain conditions. Please visit the Tokyo Gas website for details. *8 Customers bear parts costs, special work fees and fees for labor exceeding 60 minutes as well as secondary response expenses such as for equipment replacement associated with electric equipment failure or damage. We may not provide on-site service if the specific problem is not covered by this program, the problem is solved by guides over the phone or the problem concerns an extraordinary natural disaster or accident. In an emergency, such as a fire, please call the fire department and other authorities to ensure customer safety. Tokyo Gas does not report to the customer’s site under these circumstances. *9 Gas Fixture Special Support is available under certain conditions. Please visit the Tokyo Gas website for details. *10 ENE-FARM, ECOWILL, HEATS and commercial-use equipment are not covered. *11 Repair or replacement may not be possible. 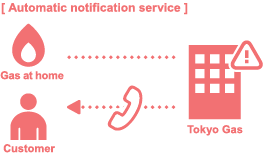 Please visit the Tokyo Gas website for information on equipment covered by the service and terms of service.